Custom printed scarves are a unique and stylish way to wear your designs. The designer scarves are available in four sizes, including square scarves and five printable fabrics. You choose from light and airy chiffon scarves to real silk scarves. A personalised scarf is also a fantastic way to launch your own brand or designer label as you can order with no minimums. We print edge to edge and finish your bespoke scarf by hand with a baby hem to ensure it does not fray. Whatever size and fabric you choose, you will receive a wonderful and unique scarf. 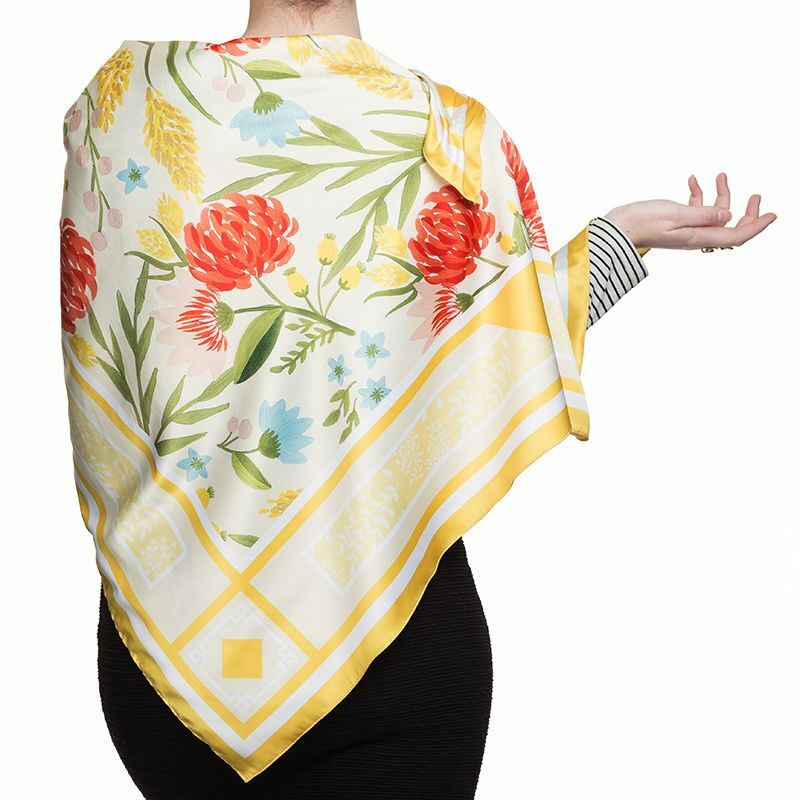 Whether you are designing scarves for women, for men, for practical use or just to look fabulous, the selection of custom printed scarves has something for everyone. Made to order with the utmost care and precision. When you make your own scarf with Contrado, you will be working with us to create a beautiful, handmade piece, completely unique to you. As well as printing everything in-house, we also cut and finish your tailor-made scarves by hand, with a tidy and fine baby hem. Update your look today and give your accessory collection a personalised boost. With no minimum orders, you can print as little as a single custom scarf to check out your design on the product before deciding to put in a larger order. A smooth silk alternative fabric, which allows a bit of light to pass through it. This is a strong and durable silk like fabric, with some stretch and a gorgeous drape. Printing on Silk Sensation showcases colours well. Detail shows very well and prints are complemented by the natural movement of the fabric. Make a real silk scarf with this 100% natural silk fabric. Lightweight with a beautiful satin weave, this feminine and elegant fabric has a crepe like finish and the most gorgeous drape. Prints will be rich. There will be limited show through of your print to the other side of the fabric. This fabric is ideal for making pretty chiffon scarves. Soft, silky and fine, this fabric is sheer and light and will allow your customised scarf to drape and flow in a feminine and fluid manner. This chiffon fabric is somewhat transparent, with a subtle base tone, which creates a strong contrast to the colour spectrum. One of our 100% natural silk fabrics, this pretty woven fabric has a gossamer appearance due to its very fine threads. This is a lovely fabric to make your own scarf with. The custom made silk is transparent, super soft and your prints will have an intense finish. A super soft muslin fabric with all of the lightness and softness of cotton, but with a lot more durability. This fabric is lightweight and transparent yet strong and shows bright colours very well. Mulmul has a naturally loose yarn, which can help give designs a slight rustic aesthetic. Because of the naturally loose yarns, there are slight colour and intensity variations in the fabric, especially in parts where the thread is looser. Due to the delicate nature of the MulMul Soft Music fabric, some pulls are to be expected and this is not out of the ordinary. We pride ourselves on giving our customers a pleasurable and unique shopping experience. This exclusive scarves are all printed and made to order by a team of technicians right here in our studio, with assistance and advice on hand at every point on your design journey. Please note: As all of our scarves are handmade to order, there will be some variance in the dimensions of the scarf. A predictable amount of shrinkage is likely to occur, this is normal and to be expected, and will be more apparent in the natural fabrics. A pretty or funky scarf will make the perfect finishing touch to a whole host of outfits. When dressing for a wedding, scarves for men and women can make an outfit go from nice to fabulous. Opt for a real silk scarves, soft muslin scarves or chiffon scarves for more special occasions and team with anything from linen suits and delicate dresses. If you are looking for a scarf for more everyday wear, choose the muslin fabric or Silk Sensation, which have the same qualities as the natural fabrics, but with more durability and strength. These look great styled with jeans, sweaters and lightweight coats. Whether you are looking to expand your product range or start your brand from scratch, we can help you sell your designs. We support creative brands and independent designers with the extensive experience of bespoke manufacturing on-demand. We can help you make your idea into a high quality physical product and sell your product how you want to. What shapes of bespoke scarves are available? How to wear a scarf really does depend on the shape. Because of this, we have created 4 totally wearable styles of custom made scarves for our diverse customers. Your designer scarv can be made into the following shapes: standard square, large square, wrap scarf or shawl and rectangle scarf. If you would like to see examples of each of these styles, please click through to the preview page. Do you have warmer scarves available for winter? As well as your Custom Scarves, which come in 6 lightweight and drapy fabrics, we also make several other, slightly thicker personalised scarves, which would be suitable for colder weather. The Custom Fleece Scarf is handmade from 2 layers of custom printed fleece, or you could design your own neck tube scarf, which can be styled in 19 different ways. Are there hemming options available for the scarves? We finish the edges with a hemming style of your choice, either baby hem or 3-thread overlock. Baby hem uses 8mm of material on each side, folded twice then a top stitch approximately 2-3mm from the edge. The 3 thread overlock trims off 3mm fabric, and has an overlock edge stitch. Due to the delicate nature of these beautiful fabrics, hems can be slightly wavy, but this adds to the authenticity. Browse from a range of unique scarf designs, created by independent artists and designers in our online marketplace. Christmas Ideas - Daisy scarf. Christmas Ideas - Cat and Daisy Scarf. With environmental consciousness in mind, our fabrics are all printed using completely water based inks. This means no chemicals or solvents are used. Our heat fixing procedure fixes the colours and prints, avoiding the downsides of steaming, such as excess or contaminated water returning into the waste system. We have one facility in London where we conduct all the printing, production and fulfillment. After your item has been manufactured, we ship your order and send you a dispatch confirmation via email through. Please add on the production time to the delivery time to calculate when your order will be with you. The delivery time will be visible in the basket and check-out page, where you can select between the delivery methods too.